5 million patients undergo wisdom teeth removal each year! Why? Wisdom tooth extraction has become a standard procedure because impacted wisdom teeth often pose a serious threat to your smile. Our dentists can conduct an exam and perform x-rays to determine if you need wisdom teeth removal. Our dentists will be transparent with you about your unique needs. While most patients do not have sufficient space in their mouths to properly accommodate wisdom teeth, some do. Most patients require wisdom tooth extraction to prevent the risks associated with impacted wisdom teeth. When wisdom teeth don’t have enough room to erupt, they may cause problems. Impacted wisdom teeth are one of the greatest possible dangers. Damage to surrounding teeth: Impacted wisdom teeth are trapped under the gums because the mouth does not have sufficient space for them. They can shift other teeth as they continue to grow. As they push against the teeth, the teeth may become crooked, and existing dental work may become affected. 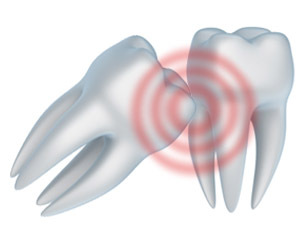 Sinus problems: Patients with impacted wisdom teeth may develop sinus pain or pressure. Some patients experience chronic congestion. Gum inflammation and infection: When the wisdom teeth try to erupt into the mouth, infection and inflammation are likely. Infected gums lead to gum recession, tooth loss, and jawbone deterioration. Tooth decay: When wisdom teeth crowd the rest of the teeth, those back molars become increasingly difficult to clean. Bacteria often becomes trapped between the back teeth, resulting in tooth decay. Cysts and tumors: Impacted wisdom teeth may cause cysts or tumors. These problems are detrimental to your oral health, causing jawbone and nerve damage. Pain: Impacted teeth and inflammation usually cause severe pain while impacting your oral health. At Oceanside Dental Excellence, we are in the business of preserving your long-term wellness. Schedule your appointment so that we can administer an exam and x-rays to decide if wisdom teeth removal is right for you. Most patients are first evaluated for wisdom teeth removal in their mid-teenage years. Older patients who never had an evaluation or who are having a problem with wisdom teeth may also schedule an exam. The earlier we address your wisdom teeth, the earlier we can use the knowledge from your exam to prevent pain and lasting damage. Schedule your appointment with a call to Oceanside Dental Excellence today. We’ved helped patients throughout the Fallbrook and Vista, CA areas address their wisdom teeth preventatively as well in serious cases involving impacted wisdom teeth.